England's Charlie Bull thanked Graeme McDowell and Ian Poulter for helping him make it through the PGA TOUR Latinoamerica Qualifying Tournament in Colombia. But Newlands' Cian Curley was bitterly disappointed with his performance and vowed to battle back soon. The Dubliner followed three successive 74s with a closing 77 to finish tied for 55th on 15-over-par in an event where Lake Nona regular Bull claimed a full exemption for the entire 2018 with the next ten players exempt until the mid-season re-shuffle. "Well that turned out to be a bitterly disappointing week," Curley said on Instagram. "I came into LatinAmerica Q School competitively un-sharp, but my game was in good shape. It deserted me completely from Day 1, and I’m at a loss as to why. "I wish I could blame the chest infection I’m currently suffering from but I can’t. It wasn’t a very difficult task to get the job done here this week. No one is more disappointed than I am in myself. "However, I’ve had setbacks before and to quote Rocky Balboa - 'It’s not about how hard you can hit. It’s about how hard you can get hit and keep moving forward.' 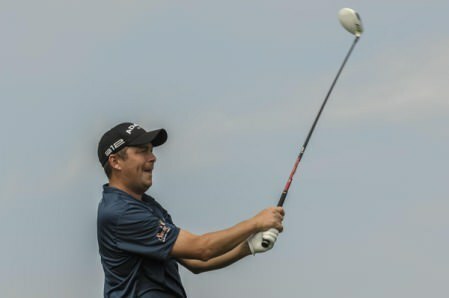 #golfishard"
Bull closed with a three-over 74 at Club Los Lagartos but still cruised to a four-stroke victory over Canada’s Blair Hamilton on six-under with Italy’s Federico Zucchetti and Canada’s Russell Budd tied for third on one-under. “Graeme McDowell and Ian Poulter are both incredibly good to me and good friends," Bull said. "I played with Graeme a week and a half ago, and I see Ian on a daily basis when I’m practising (at Lake Nona outside Orlando). Willie Mack III led a pack of four players at even-par and tied for fifth. The other three were Brazil’s Sandro Piaget and Americans Dalan Refioglu and Brian Bullington. Five players played off for the final three full-exemption spots, with American Chase Hanna, Mexico’s David Faraudo and Spain’s Mario Galiano prevailing. Hometown favourite Juan Pablo Luna and American Shane Smith were the odd men out but will still have conditional status for the first half of the 2018 PGA TOUR Latinoamerica season. The final PGA TOUR Latinoamerica Qualifying Tournament is next week in Buenos, Aires, Argentina. The Jack Nicklaus-designed Pilara Golf Club is the site.